Happy Fall! It’s the season of fall fun, apples and pumpkins, and halloween!! Cooler weather should (hopefully!) be arriving and we can get outside to enjoy the crisp air and scenery in the beautiful DMV area. DC may be the hub of city-life in our area, but Virginia and Maryland host some of the most entertaining farmland fun for kids and adults alike! If you’re tired of being stuck inside because of all the rain, this weekend’s predicted weather is just the reason to hop in the car and enjoy some fun on the farm! A local tradition, probably one of the most popular fall festivals in Northern Virginia! Slides, tunnels, hayride, live entertainment, and swings! September may mean back to school for many, but at Great Country it means back to the farm for freshly pressed cider and apple picking. October brings the pumpkin season to GCF. Come celebrate and create an unforgettable experience picking pumpkins, cheering on the fastest piggie, doing some pumpkin munchin’ with P-Rex, getting lost in the corn maze and having your little ones meet the pumpkin princess. Don’t forget those freshly made Cider Donuts! Pumpkin Village is Leesburg Animal Park’s signature Fall Festival. Year after year, families, groups and schools spend a crisp fall day enjoying loads of great activities such as giant hill slides, hayrides, moon bounces, pedal carts & more. Celebrate the harvest at the farm during the remarkable Temple Hall Fall Festival — six weeks of autumnal adventures at Temple Hall Farm in Leesburg, Virginia. Bounce on the giant jumping pillows, see pumpkins and corn soar through the air from our pumpkin blasters and corn cannons, watch live music or pig races. Don’t forget their famous 20-acre corn maze. Visit the general store to buy your halloween pumpkin and other autumnal treats. 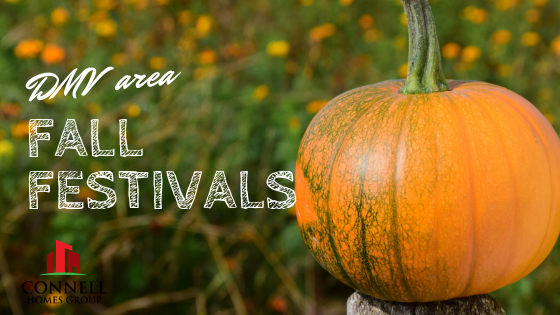 Tons of fall activities along with everyday farm fun–Pumpkins and hayrides, rolling tunnels, big slides, huge jumping pillows, Virginia’s longest swinging bridge, a goat petting farm, and fire pits for roasting marshmallows! The corn maze theme this year is Emojis with several expressions located all around the farm! Come out and enjoy the 120-acre farm with lots of fun activities! Friday, October 27 and Saturday October 28 you can join the talented Loudoun Valley High School Performing Arts program, as they spook you as you wind your way through the corn maze in the dark! More than a walk thru stalks. At the Corn Maze in the Plains, VA, the Fall Festival offers fun for the whole family, from toddlers to teenagers to adults! Find out why Corn Maze in the Plains has been chosen as the top corn maze in the D.C area. Come see why this family-fun oriented, noncommercial getaway is the perfect place for making fall memories you’ll cherish! Come experience the difference in our special Corn Maze and see why folks keep coming back year after year! Be a part of the tradition! Whitehall Farm is excited to announce their fourth annual Fall Fun Day events! Lots of family friendly fun featuring a corn maze, animals, nature trails, inflatable bounce houses, lawn games, wagon rides, and a pumpkin patch. A farm-to-table lunch option will be available, featuring farm fresh ingredients from Whitehall’s farm store. While the Maize Maze and Pumpkin Patch are primary attractions at Belvedere Plantation in the Fall, there are 30+ activities and events to make your visit really exciting! Butler’s Orchard celebrates the harvest each year by inviting families from all over the area to share traditional autumn activities and enjoy a country outing! Cash Only at Gate. ATM on site or purchase ticket at the market with your Visa or MasterCard. A Jack O’ Lantern landscape featuring single pumpkin carvings and larger than life displays! Best showcased at night, this is a walk through display of amazing pumpkin illuminations and creations.